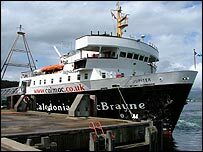 Plans to put Caledonian MacBrayne ferry routes out to tender have won the backing of the Scottish Parliament. In a lengthy Holyrood debate, Transport Minister Tavish Scott argued that it was the only way to satisfy European competition rules. Assurances were made that the pay, conditions and pension arrangements for the workforce would be guaranteed. The promises proved enough to persuade Labour backbenchers, who had earlier helped defeat the move last year. Mr Scott's resolution, asking MSPs to acknowledge that tendering of CalMac ferry services on the Clyde and Hebrides would protect lifeline services, was passed by 63 votes to 53 with one abstention. An SNP amendment describing the tendering proposals as "flawed", and urging the Scottish Executive to pass the matter over to Holyrood's transport committee for final consideration, was defeated by 64 votes to 37 with one abstention. A Tory amendment which argued there was scope for efficiency savings and urged the executive to issue proposals for smaller bundles of routes to attract commercial interest was defeated by 98 votes to 16 with three abstentions. A Scottish Socialist Party amendment opposing the tendering proposals as "unnecessary, unacceptable", and in conflict with the need to defend lifeline services and jobs was defeated by 78 votes to 37 with one abstention. CalMac is fully state-owned and receives about £25m a year from the executive, but the EU has said taxpayers must be given value for their money. Since MSPs rejected opening up the routes to private operators last December, the SNP and unions argued against the plan. But prolonged discussions between ministers, officials and the European Commission left the executive in no doubt that going out to private tender was the only way forward. Mr Scott said: "Tendering is the only way open to ministers and parliament to protect the vital lifeline Clyde and Hebrides ferry services." The consequences of not complying with EU regulations could be "severe", Mr Scott claimed, saying the European Commission wanted the issue resolved. 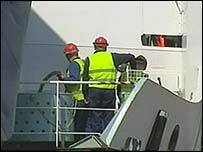 "The commission could order the immediate cessation of subsidy to CalMac and order the executive to recover from CalMac all subsidy that had been declared to be illegal state aid," he added. "This would, quite simply, put CalMac out of business and bring its services to a halt." Labour's Highlands and Islands MSP Maureen MacMillan said she had hoped that CalMac could avoid the EU regulations but insisted this was not possible. She said the focus must now be on protecting the pay and conditions of CalMac workers in the tender documents and contract specifications. "I agree with those who say tendering is not cost effective but the commission does not care about cost effectiveness, it only cares about competition for the subsidy," Ms McMillan said. But she added: "If we do not swiftly comply with the European directive the tendering of the ferry service will be taken out of the executive's hands and could well then be tendered route by route, which would be a catastrophe for the west Highlands and islands, for communities and the workforce." Mark Ballard, of the Scottish Greens, told Ms MacMillan that if she and other MSPs did not want tendering should fight against it. He said: "There are huge advantages in keeping these ferry services together under a publicly-owned and accountable company." Liberal Democrat MSP for Argyll and Bute George Lyon spoke out about what he said islanders in his constituency wanted. He said: "They want a decision to be taken and an end to the uncertainty. "The best protection for the workforce and the best protection for Caledonian MacBrayne and for the communities it serves is to bite the bullet and support the proposals." The Tories' David Davidson was fully supportive of tendering but argued that tendering en-masse would crowd out bids from smaller companies who may run the service more efficiently. However, Socialist MSP Tommy Sheridan claimed putting the service out to tender was "privatisation". He added: "We should be putting the communities first, the workforce first, the service first. That's why this tendering is not only unnecessary, it's unacceptable." The Scottish National Party's Highlands and Islands MSP Rob Gibson accused the executive of having "a poor degree of vision" for the people from his region and proposing "a very poor deal for taxpayers and the workforce of CalMac".